We take the time to educate and work with our clients to create a beautiful landscape that is functional, resilient, and eco-friendly. 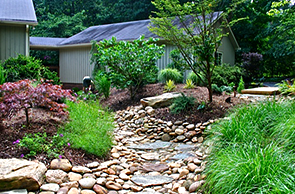 We are certified plant professionals, trained in energy saving landscaping methods and passionate about nature. We've been creating sustainable landscapes that limit the use of valuable natural resources, reduce waste, and prevent pollution for over 25 years. Sustainable gardens aren’t bland and boring, they use ecologically correct plants and placement to create a beautiful and easy to maintain landscape. 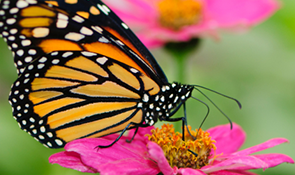 We create low maintenance gardens that can be beneficial to pollinators and other native species. Our team will use native plants that are perfectly suited to the conditions of your yard to create a long-lasting garden that is beautiful and ecologically correct. Using the right plants keeps your garden low maintenance and helps it to thrive while fitting in with the surrounding plants and trees. We use hardscapes, waterscapes, and artful sitting areas to make your yard functional and dynamic. 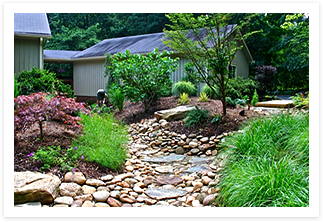 To get started bringing your landscape back to nature, fill out our contact form or give us a call.